10'w graphics are viewable from across a room. Transport case protects supplies in between trade show events. 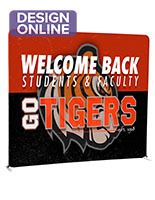 Tension fabric pulls graphics tight to create a clear viewing of your message. Tubular frame has a snapping button system for View Setup Instructions. 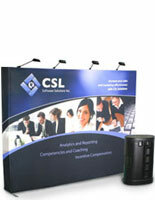 This trade show graphic stand is designed for positioning at the rear of a demonstration. The backdrop exhibit measures just less than 10 feet wide and features a vertical curve. 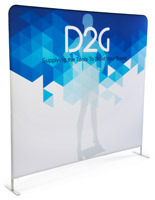 This trade show graphic stand, also known as custom-printed banner, is 92" tall, which completely covers the entire backing of a booth. Illustrations are submitted after checkout and are reviewed by a customer service representative to make sure the designs match perfectly to the provided guide. 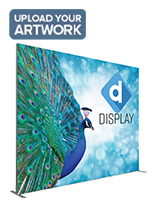 These trade show graphic stands then go through a dye-sublimation printing process, creating 600 DPI images, which are brightly-colored and extremely detailed. The stretchy material, used to create these tradeshow backdrops, slides over top of the aluminum framing. The snug fit will pull your advertisements taut, eliminating wrinkles and folds. 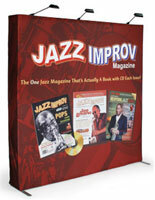 These trade show graphic stands set up in minutes! Simply snap each part of the stand together. No additional hardware is needed! 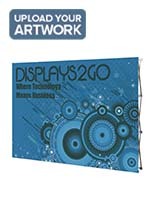 These trade show booth backwalls are also incredibly portable. 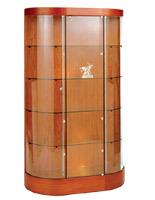 The display fixtures break down into separate parts that store inside the included shipping container. Built-in wheels reduce the strain associated with carrying a heavy load! 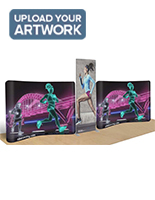 This trade show graphic stand gives users the ability to incorporate a company's logo or emblem into any booth. The contemporary design of these backdrops creates a seamless and professional-looking display to which passersby will be drawn. 19.0" x 56.0" x 19.0"